The 1940s were an exploratory time for watch manufacturers as is evidenced by the great diversity of case designs during this important period of the development of the wristwatch. Presented here is a wonderful example from Ulysse Nardin a widely acclaimed Swiss watch manufacturer founded in 1846, housed in a delicately balanced case, that’s half stainless steel and half rose gold. Made by Frères Borgel, the case bears a remarkable resemblance to another case made by the same manufacturer, the iconic and beloved Patek Philippe Ref. 1463, which many believe to be one of the most well-executed chronographs ever made. Just like it, the watch features two onion-top chronograph pushers seemingly large for a case of its size, giving the timepiece greater presence on the wrist. Remarkably, the case seamlessly fuses pink gold and stainless steel, the only clear delineation occurring at the lugs. This tasty little chronograph must have been designed for a lover of the great outdoors as it features a 12-hour revolving bezel insert and a screw-back protecting the fine movement from humidity and dust. The watch is powered by a manual-winding “Valjoux 23” featuring a 30-minute counter at 3 o’clock, with a small seconds register placed opposite to balance out the dial. The dial is preserved in stunning condition, and features gold Arabic numbers at the hour markers and alpha hands. The designation on the dial under the Ulysse Nardin inscription logo reads “Locle Suisse”, referring to Le Locle, the historic headquarters of their factories. This very tasty chronograph is fitted with a leather strap, giving it both a classic and versatile look. Well preserved, and in overall excellent original condition, the watch retains strong definition throughout the case and lugs. Founded in 1846 in Le Locle, Switzerland, Ulysse Nardin is a widely acclaimed Swiss watch manufacturer that earned recognition for its precision chronometers during the early to mid-twentieth century. Ulysse Nardin himself was a trained watchmaker under the guidance of his father, Leonard-Frederic Nardin, as well as master watchmakers Frederic William Dubois and Louis Jean Richard-dit-Bressel. 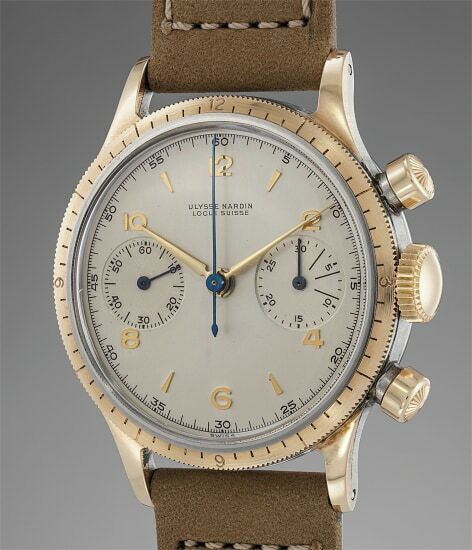 Collectors in particular seek this brand's oversized vintage chronograph wristwatches, including the reference 7536-2.